In Arthurian legend and romance, Queen Guinevere was famous as the wife of King Arthur and the lover of her husband’s best knight, Sir Lancelot du Lac. In some stories, she is presented as being virtuous and honourable, while at the same time being fatally flawed. In other stories, she is an overtly immoral and sexually promiscuous woman who cheats on her husband, King Arthur the great hero of the Britons. Rightly, or wrongly, mud sticks and her affair is often seen as the cause of the fall of Camelot. Guinevere unfairly gets most of the blame. In fact, there were several other people whose actions significantly contributed to this disaster, including Arthur himself, Mordred, and other Knights of the Round Table. The Arthurian world is a colourful mix of heroism, adventure, and romance, but there is also much tragedy to be seen. Arguably the most tragic is the love triangle of Guinevere, Lancelot, and Arthur, that in many ways mirrors that of Tristan, Iseult, and King Mark but has more severe consequences, not just for themselves but the rest of the Arthurian world. Some scholars of Arthurian legend and romance see many of the stories of King Arthur and his knights, in legend and medieval romance, as being dramatizations of the adventures of Celtic gods and important natural events in Celtic mythology. They believe there was a special relationship between the king and the gods and the king and the land. To ensure the fertility of the land, the king was wedded to the goddess of the land, who was also the goddess of sovereignty. Presented here is a retelling of a story from Le Morte D’Arthur, by Sir Thomas Malory, of how Guinevere was rescued by Sir Lancelot after being abducted by a wicked suitor, how the two slept together, and how he saved her from burning after being accused of adultery and treason. This is followed by a brief discussion on how some Arthurian scholars see Guinevere as a personification of a goddess of sovereignty, and why this may influence how she is perceived. On hearing Sir Lancelot had arrived and the commotion at the gates, Meliagrance ran to Guinevere saying, “Lady, I beg you have mercy upon me, I put myself at your good will!” and begged her to protect him from the angry knight. After mocking him, in order to keep the peace, she agreed and persuaded Sir Lancelot to put aside his anger. Then she led him to see the other knights who were recuperating from their injuries in a partition in her chamber. Later, Lancelot and Guinevere found a chance to talk alone and so glad were they to see each other again they agreed on a tryst that night. At midnight, Lancelot would appear at the barred window of her chamber while all were asleep and in their beds. Later that day, Sir Lavaine arrived at the castle gates, crying out in great anxiety for Sir Lancelot, who went down to meet him. The two talked together and Lancelot told him that he was going to meet with Guinevere in the night. Sir Lavaine warned him against this, but Sir Lancelot was adamant he would keep the tryst. That night, using a ladder, he climbed up to Guinevere’s window. She was waiting for him and, after they whispered their greetings, he told her that he wanted more than anything to come into her chamber, but the window was barred with iron. She told him she wished for the same and, after seeking her further reassurance that this was truly her desire, he grasped the bars and with all his strength wrenched them from the window, but in doing so cut his hand. Not noticing blood oozing from the wound he climbed in to join her. The two went quietly to her bed and stayed there all night long. Before sunrise, he climbed back through the window replacing the bars as best he could and went to his own chamber. At 9 o’clock in the morning, Sir Meliagrance went to Guinevere’s chamber and found her ladies awake and dressed, but the queen still in bed with the curtain pulled around it. “Lady, why do you sleep so long, are you ill?” he said and drew back the curtains. Seeing the blood on her sheet — and upon herself — from the wounded hand of Sir Lancelot, he immediately accused her of lying with one, or more of the wounded knights, who lay nearby and called them to witness. Guinevere rightly denied the charge because it was Sir Lancelot she had slept with, but she said nothing of that. When Sir Lancelot arrived and learned of the accusation, saying nothing of where he had been in the night, he warned Meliagrance that he would fight to defend the queen against any malicious accusation. However, Meliagrance was emboldened by what he and the others had seen and declared he would take the accusation to King Arthur and, if found guilty, she would be burnt at the stake. Lancelot again warned that he would defend the queen with his life. The accuser then laid down his gauntlet, challenging him to a duel to prove her innocence. 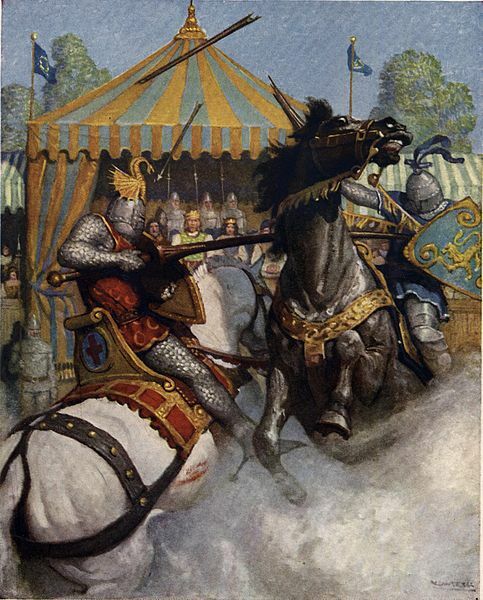 Lancelot readily accepted and a date was set eight days hence when they would meet in battle in the fields of Westminster, before King Arthur and his court, and fight to decide the outcome. 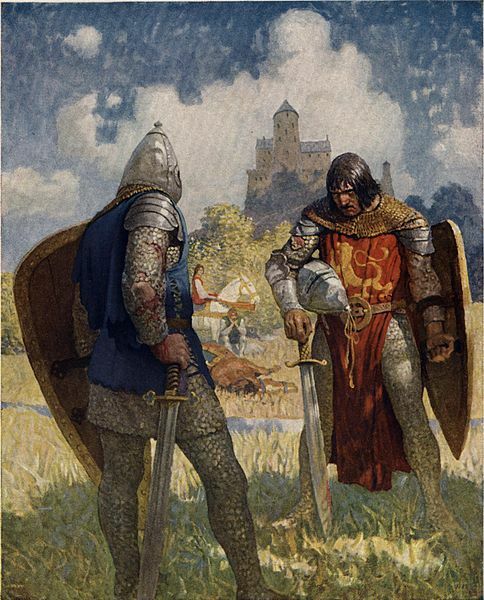 With the trial by combat terms agreed, Meliagrance had formulated a treacherous plan and acting in a friendly, courtly manner, offered to show Lancelot around his castle, an offer that was accepted out of courtesy to Meliagrance as was the way of true knights. Meliagrance took Lancelot on a tour of his castle, showing its entire splendour, going from room to room and around the ramparts. With Sir Lancelot at his ease, he led him to a certain room and contrived it so that his guest stepped upon a hidden trapdoor. The weight of Sir Lancelot opened the trapdoor and he fell into a deep and dark dungeon. The host closed over the door, leaving his guest imprisoned. Going to the stables he hid Sir Lavaine’s horse and went to meet the others at dinner as if nothing had happened. At dinner, Guinevere, the ten wounded knights, and Sir Lavaine assumed that Lancelot had simply ridden away alone on some errand, as he had done so many times before, taking Sir Lavaine’s horse after the slaying of his own. After dinner, Sir Lavaine organized litters for the transportation of the wounded knights and then escorted Queen Guinevere and the party to Westminster. On arrival, he explained to King Arthur how Meliagrance had accused the queen of treason and how he had demanded she be burnt. He told him Sir Lancelot had taken up the gauntlet of the accuser to defend Queen Guinevere. “We think he has taken Sir Lavaine’s horse on some errand of his own,” said Guinevere. “I am sure he will be here in due time, though I fear some treachery!” said Arthur. “If that is truly all you ask I will grant it,” said Sir Lancelot, and he kissed her. As promised, she brought him his armour and weapons. Opening the door of his prison she led him to the stables, offering him the pick of the horses. 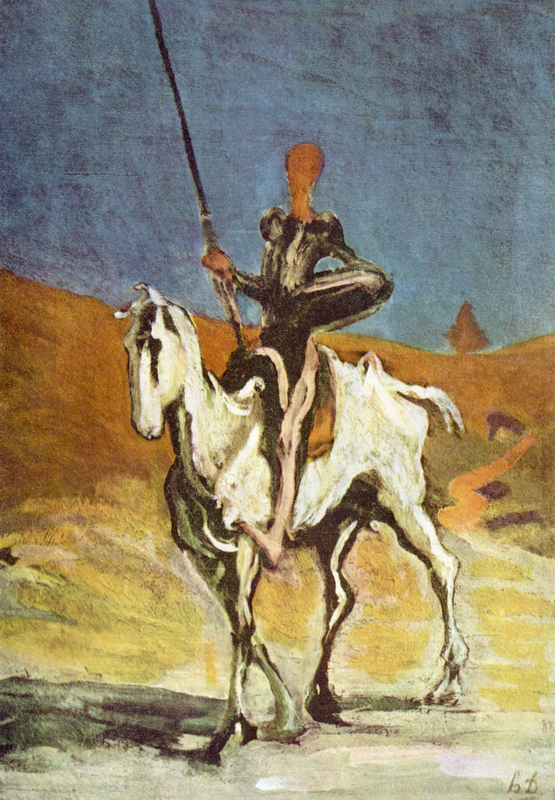 Lancelot chose a white charger and bade the stable hands saddle the horse while he donned his armour for battle. Mounting his steed he turned to thank the lady, and fully armed with spear, shield, and sword, rode to Westminster and his deadly rendezvous with Sir Meliagrance. “I thank you, Sir Lavaine, I give my permission and know you will do your best!” said Arthur. “Sir Lancelot, are you sure on this? Will you abide by the conditions you yourself have set?” asked the King. “That I do, for I never go back on my word,” replied Lancelot. Then he removed his armour in the way he said and had his left hand tied behind his back. With only a sword in his right hand, he prepared to battle with Meliagrance who still wore his full armour and carried his shield and sword. Meliagrance, thinking he would be easy prey, rushed at him swinging his sword high, but Lancelot deftly stepped aside and dealt such a powerful blow to his head that it split his helmet asunder and killed him outright. Sir Lancelot had proven the innocence of Guinevere of the charge made by Meliagrance and decided by Arthur’s own laws, but their own adulterous liaison remained a secret from the King. Nevertheless, Arthur was overjoyed his wife had been proved innocent of the charges and ordered her to be freed from the stake and they both embraced Sir Lancelot. 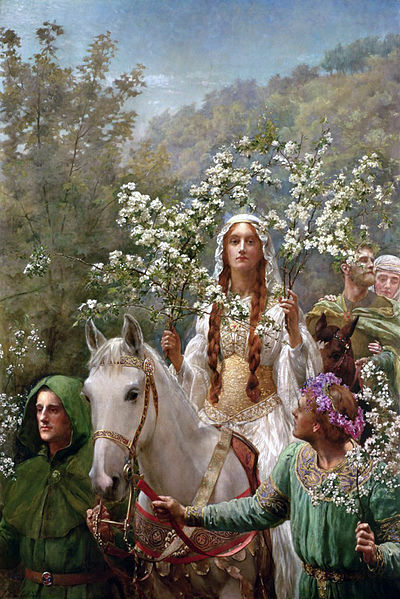 Many devotees of the Arthurian see Guinevere as representing a Celtic or earlier goddess of sovereignty, disguised and hidden over time by various storytellers to become the unfaithful and promiscuous wife of King Arthur. Not everyone subscribes to this view, and there is no shortage of other ideas of how Celtic and earlier influences became embedded in these stories. The role of the goddess of sovereignty was to ensure the fertility of the land and was the personification of the land looking after its best interests. To fulfil her task she needed a suitable male consort who was virile, strong, and dynamic, who would be the king and sovereign of the land but never own it. He was replaceable as and when the need arose, such as when he grew old, was too sick, or was injured, or failed for any reason to fulfil his role. It was through the goddess of sovereignty that kingship of the land was bestowed on the most suitable candidate available. There is a hint from Malory that Guinevere may have set up her own abduction, perhaps as some kind of test as she deliberately leaves her own company of guards, the Queen’s Knights, behind to rely on ten lightly armed knights without their armour. It may be that Arthur, for all his greatness, was ageing and with age lost his former vitality and potency. Therefore, a younger, more dynamic replacement was needed to ensure the fertility of the land. It was Lancelot she sent for to rescue her and not her husband. In this story,Guinevere has been abducted and rescued, then accused of a crime and in danger of being burnt for adultery and treason. Lancelot has proven to be the strongest and most potent of her suitors, which is exactly what a goddess of sovereignty needs. As the personification of a goddess of sovereignty, her relationships with more than one powerful male should not be seen as sexual promiscuity or immoral behaviour but purely the human representative of the goddess fulfilling her role and purpose. If seen in this light, Guinevere then becomes someone who is striving to fulfil her divine role as representing the goddess of sovereignty. Her relationship with Lancelot is not out of sexual promiscuity, but as a necessity to fulfil her role in the best interests of the land. The problem for her is that as a woman she does love Lancelot and she does love Arthur, and there lies the divine tragedy for she is destined to lose both in the end. 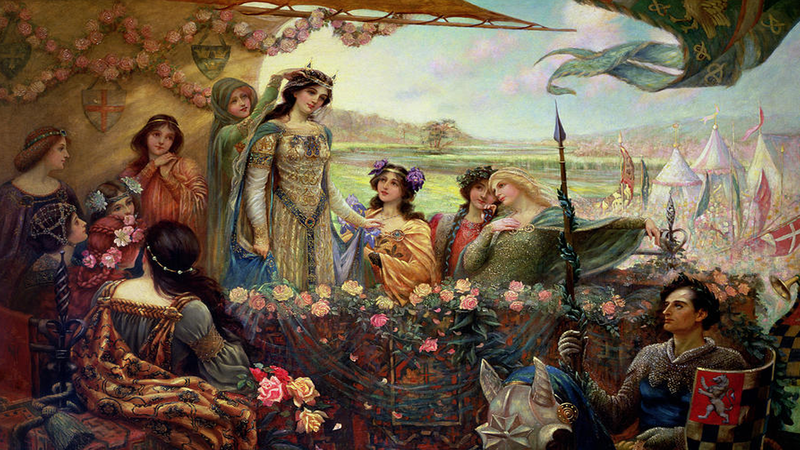 [Doc] Guinevere: The Sovereignty Goddess of Arthurian Literature? Pingback:	The Arthurian Realm: The Abductions of Guinevere – Under the influence! Pingback:	The Arthurian Realm: The Divine Role of Guinevere – Under the influence!